Order Space Sailing at Amazon.com. Click on title for order information (new window). 258 pages. Contents: Introduction to Sailing, To Distant Shores, Sailing Ship Design, Sailmaking, Sailing Ship Construction, Sailing Operations, Beamed Power Systems, Scenarios of the Future, Solar Pressure, Forces and Moments, Trajectory Analysis, Heliogyro Dynamics. Space sailing and light sailing are the general terms for sailing in space using large reflectors for propulsion. Solar sailing is based on the use of pressure from sunlight reflecting off of a large, low-mass sail to produce a force, which results in acceleration of the ship. Solar sailing ships can carry cargo and people throughout the solar system at a fraction of the cost of other propulsion methods. Laser sailing and beam sailing refer to sailing by means of beamed energy which impinges on sails to provide propulsion. Maintenance of special 'artificial' orbits for observations, etc. Protection of Earth and other planets by asteroid deflection, shielding, warming, and illumination. In the 1860's, James Clerk Maxwell predicted that electromagnetic radiation exerts a pressure because of the momentum property of the radiation. Jules Verne recognized the potential to propel ships through space using light pressure. Svante Arrhenius predicted that objects could travel between stars using light pressure. Frederick Tsander developed the concept of, and coined the expression, solar sailing: using sunlight reflecting off of mirror surfaces. Work at Battelle Memorial Institute and the Jet Propulsion Laboratory in the 1970's began the widespread interest in solar sailing. Unfortunately, NASA managers then went for more than 20 years without a willingness to fund solar sail technology or a demonstration. The information presented in this site is based on research conducted at Battelle Memorial Institute in 1974-75, the Jet Propulsion Laboratory in 1976-77, and subsequent work by the author. Some of the material is more recent than that in the book Space Sailing, by Jerome L. Wright, published by Gordon and Breach, Philadelphia and London, 1992. However, the book has a more complete coverage of the technology. 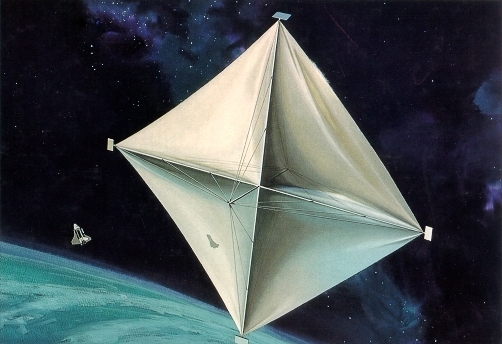 JPL estimated the cost of the first production unit of an 820-meter solar sail at $65 million, for use in 1982. A second unit would cost a bit less, and could have been produced by about 1984. Adding some electronics to make it functionally independent might have pushed the cost to around $70 million. If launched in 1986, it could have completed six round trips to Mars by this time, delivering a total of nearly 20 tons of cargo. Those voyages would have been done without propellant or rebuilding of the ship, other than normal maintenance. With the success of that ship, it would have been reasonable to have built a 2000-meter sailing ship, perhaps by 1990. The larger ship could have made four round trips by this time, delivering potentially 100 tons of cargo to Mars. Those same ships could still be operating. With the same kind of excitement people had a hundred years ago when they welcomed ships such as Flying Cloud back to their home ports from voyages to distant places, people today could follow the progress of the ships from Mars, past a couple of asteroids, then into Earth's gravity field, before easing into a parking orbit for a stay of a few months before their next voyage to Mars. If you asked NASA managers why such ships were never built, they would likely reply that they were not needed to meet NASA's goals. In the author's opinion, this is an enormous, inexcusable hubris. What NASA managers want should be irrelevant. What the supporting taxpayers want should be of the highest importance. The public has shown conclusively that it has a very strong interest in the exploration of Mars. They have also made it clear in many different circumstances that they want maximum value for their tax dollars. $70 million for a ship capable of making a round trip to Mars every 26 months without consuming propellant is unquestionably cost-effective. So, where are the ships?